This giant has chiseled, muscular features and a flat, forward-sloping head, looking almost as if it were carved of stone. This is a breakout SoundSet from the Pathfinder Adventure Path SoundPack. If you are a subscriber you will automatically gain ownership of this SoundSet. 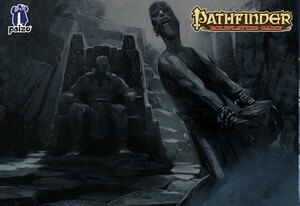 Stone Giant Battle SoundSet © 2014 Paizo Inc. Paizo Inc., the Paizo golem logo, Pathfinder, and Pathfinder Adventure Path are trademarks of Paizo Inc. Sounds created under license with Paizo Inc.